You are here: Home / Water and Air Education / Air Pollution: Greatest Threat Facing Mankind? Imagine a tree-lined horizon where a smoke stack rises into the sky with grey smoke pouring out over all the greenery. This is a view I saw when playing outside my family’s house as a child. There is an eerie appreciation to be gained at the sight of nature being pushed aside for industry that provides the products and services we consider essential to everyday life. So we might consider pollution to be an unfortunate but seemingly necessary by-product of human progress. The effects of which have been wide and far reaching since the start of the industrial revolution during the 1700s up through much of the 20th century as factory output was unregulated and its impact on human health went unchecked for a long time. Over the last half-century our understanding of air quality’s affect on human health, wildlife, and climate patterns has improved. Agencies such as the Environmental Protection Agency (EPA) in America seek to control emissions to protect human health by dictating safe levels of outdoor and indoor pollution. 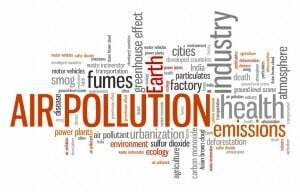 Still, there remains controversy regarding the actual costs associated with the creation of more strict pollution standards versus the realized human and environmental benefits. But there is more to it than just cost. If we view global morality statistics we can estimate 56 million people die each year from various causes. According to a 2012 World Health Organization report, 1-in-7 (8 million) yearly deaths are directly attributed to air pollution. This marks air pollution as one of the single greatest environmental risk factors that humans currently face. What do we Need to Know About Air Quality? Nations are free to enact their own environmental laws to limit or reduce the output of harmful particles and gases. In developed nations with economic stability and greater access to innovative technologies, industry can often exist while limiting environmental impact. But for all our advancements into renewable energy and zero emissions, we live in an era where many nations are now undergoing a sort of industrial revolution of their own. Explosive growth has benefited many once small economies primarily in India and eastern Asia. It is in these regions where leaders struggle to balance economic demand with air quality and the health of their citizens. Knowing what we know now it might seem prudent to demand other nations fall in line with our environmental polices, however no country may impose such rules on another. As is, there are global frameworks in place designed to promote new environmental rules and regulations that won’t infringe too greatly on economic development. The World Health Organization writes that a lack of awareness of the international evidence from both developed and developing countries linking ambient air pollution exposure and health is under-appreciated, and the potential solutions that can be taken to improve air quality would greatly benefit public health and reduce burdens on local populations and governments. To understand the problem of air pollution, we need to examine a few different elements and their impact on human health. In America, The Environmental Protection Agency lists 6 common air pollutants that pose the greatest harm to human and environmental health. They are refereed to as criteria air pollutants because the EPA uses science-based guidelines for setting permissible levels of each. The sources of these pollutants primarily result from vehicle emissions and fossil fuel power plants. Ozone (O3) – A chemical reaction created when oxides of nitrogen (NOx) and volatile organic compounds (VOC) react in the presence of sunlight. This is not the same as the ozone layer around Earth. Asthma is often the result of unsafe ozone levels. Particulate Matter (PM) – A complex mixture of small particles and liquid droplets that persist in the form of nitrates and suflates, organic chemicals, metals, soil, and dust. The concern over these particles are due to their small size. A particle whose diameter is less than 10 micrometers can pass through the throat and nose to enter the lungs. Carbon Monoxide (CO) – Emitted during combustion processes, the colorless and odorless gas is common in urban areas where a greater number of cars reside. CO reduces the bodies ability to transport oxygen to the heart and brain. High CO levels can result in death. Nitrogen Dioxide (NO2) – A group of reactive gasses known as oxides of nitrogen, or nitrogen oxides (NOx) that is commonly referred to as smog and is associated with acid rain. NO2 contributes to ground-level ozone formation, and fine particle pollution, both of which are linked to adverse respiratory problems. Sulfur Dioxide (SO2) – Highly reactive gasses known as oxides of sulfur that are primarily a product of fossil fuel combustion at power plants and industrial facilities. While unsafe to inhale, the Center for Science in the Public Interest lists SO2 as a safe food preservative. Lead (Pb) – Naturally found in the environment and manufactured products, its emission from the transportation sector has declined 95 percent between 1980 and 1999. In that same period lead in air levels decreased 94 percent. Effects on humans range from high blood pressure and immune disorders, to neurological and behavioral problems often seen in infants and young children. In part 2 of this blog, we’ll discuss the diseases that are caused by air pollution, and ways we can improve air quality in our lives for a healthier and happier future. Read part 2 here.